Buffalo Sabres General Manager Darcy Regier announced today that restricted free agent forward Derek Roy and defenseman Nathan Paetsch have accepted a one-year qualifying offer from the club. Roy, the 5-9, 187-pound center, appeared in 70 games last season, collecting 46 points (18+28). During the 2006 Stanley Cup Playoffs, Roy finished with 15 points (5+10) in 18 games. In his NHL career, Roy has collected 65 points (27+38) in 119 regular season contests. 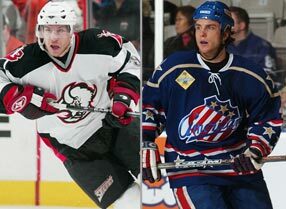 The native of Ottawa, Ontario was Buffalo’s second-round (32nd overall) selection in the 2001 NHL Entry Draft. Paetsch, the 6-1, 196-pound native of LeRoy, Saskatchewan, picked up one assist (0+1) in his NHL debut against the New Jersey Devils on January 7, 2006. Paetsch made his Stanley Cup playoff debut in Game 7 of the Eastern Conference Finals against Carolina. In 2005-06, Paetsch appeared in 72 games with the Rochester Americans (AHL). His 50 points (11+39) was good for ninth among AHL blueliners. Paetsch was Buffalo’s seventh-round choice (202nd overall) in the 2003 NHL Entry Draft.